I love oatmeal cookies, and especially chocolate chip oatmeal cookies. Like all cookies, and particularly the one of chocolate chip persuasion, there are countless variations but I think the one that everyone should have up their sleeve is a classic chocolate chip oatmeal cookie. There are countless variations and recipes for this also but the general consensus remains: a classic is the one that is essentially no nonsense. It’s just plain and simple, yet also the one that practically asks to be had with a glass of milk. It’s buttery and has just the right amount of sweetness without hurting your teeth and when you make it – it’s just right. It hits the spot. With that said, I’m pleased to say that I’ve finally got an oatmeal cookie on Z’s Cup of Tea. Since WordPress.com’s decision about the comment system, which I wrote about here, I am aware some of you are having difficulty commenting. It is out of my power at this time, so if you have a question or feedback about a recipe but cannot comment without logging in, use the contact form and I’ll get back to you there in a timely manner. My sincerest apologies for this inconvenience. While making the batter, in the early stages I became intoxicated (dare say I swooned) with the pleasing scent of butter, brown sugar, and vanilla. Before I mixed in the oats, I’m not sorry to say that I took a small taste of the batter and for a moment, I was swept away with an idea for cupcakes that I intend to create. 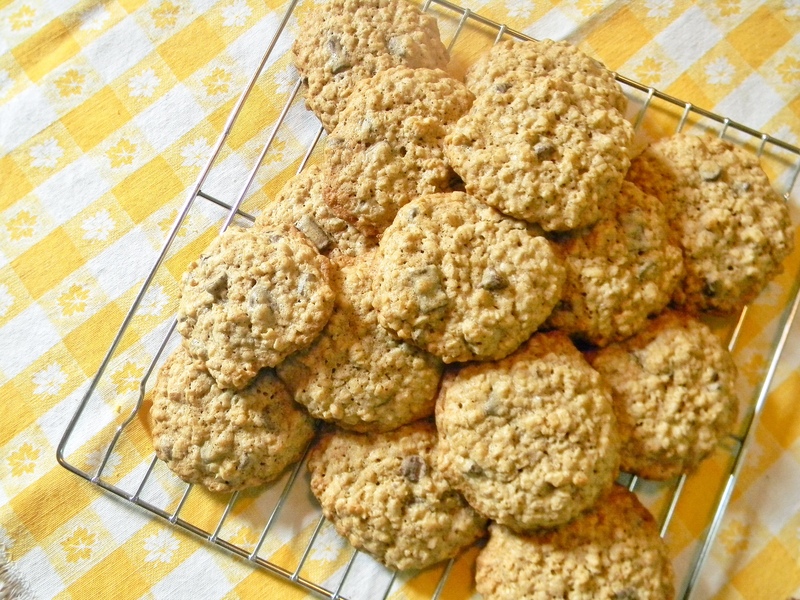 The recipe for these oatmeal cookies is tweaked only ever so slightly, the biggest change behind to make it gluten-free and to use chocolate chips instead of raisins. I also learned that softened butter, soft enough to easily spread on a slice of bread or buttering a baking pan, is ideal: it actually helps toward better flavour coming through. The first time I made these cookies, the butter was softened but it was still firm: better suited to biscuit making and such. The cookies still tasted good, but when I made them again with the butter that had been allowed to soften completely, the feedback was that the cookies tasted better and I concured. Using half a teaspoon of baking powder will make a soft cookie with crisp edges, while using a full teaspoon will make a crisp cookie throughout. It’s completely up to you! If you want a chewy oatmeal cookie, leave out the baking powder altogether and only use the baking soda. Cream the butter, brown sugar, egg, and vanilla together until smooth in a large bowl. In a separate, medium-sized, bowl mix the flours and cornstarch together with the baking soda, baking powder (if using), cinnamon, and salt. Use a flexible rubber spatula to gently mix the dry ingredients into the wet ingredients, until a smooth dough is formed. Mix in the oats and add the chocolate chips or chunks last. Scoop tablespoon-sized amounts of dough on to the prepared cookie sheet, spacing two inches apart. Bake for 10-12 minutes, or until the edges are browned slightly. Remove from oven and cool on the pan for 5 minutes before transferring to a wire rack, letting them finish cooling completely. Yum! They look really delicious. Biscuit recipes like this one are always keepers! Yum! Think I have all of the ingredients. Sounds so good I better plan on baking tomorrow. Hi Sherri, hope you like them! I’d love to hear how they work out for you.